SOUNDGARDEN celebrates the 25th anniversary release of its classic 1991 album "Badmotorfinger" by releasing four special editions on November 18 via UMe/A&M Records. The North American and European pre-orders launch today. See below for pre-order links. Those who pre-order will receive an instant download of a studio outtake of the track "Rusty Cage". The limited-edition seven-disc Super Deluxe Edition consists of four CDs, two DVDs, and one Blu-ray audio disc with 109 tracks total: 79 tracks, videos and mixes are previously unreleased. The CD audio content includes the original album newly remastered; 15 previously unreleased studio outtakes newly mixed from the original analog multi-tracks plus the track "New Damage" featuring Brian May from QUEEN; and "Live At The Paramount": SOUNDGARDEN's first-ever complete concert album newly mixed from the original analog multi-tracks and recorded at the Paramount Theatre in Seattle on March 6,1992. The band's first complete concert video features "Live At The Paramount" on DVD, newly edited from the original camera masters and newly mixed in 5.1 surround sound and stereo from the original analog multi-tracks. The second DVD is "Motorvision + More": SOUNDGARDEN's 1992 "Motorvision" home video, released on DVD for the first time ever, showcases live selections from the two nights shot at the Paramount Theatre in March 1992 along with interviews from the band and friends. Bonus videos include 11 unreleased archival live performances from various shows and festivals in 1992 and the three official music videos from the album. The Blu-ray audio disc contains the original "Badmotorfinger" album, three B-sides, and the three official music videos, newly mixed from original analog multi-tracks in audiophile 96kHz 24-bit 5.1 Surround Sound. The original album and three B-sides feature newly designed visuals directed by Josh Graham. 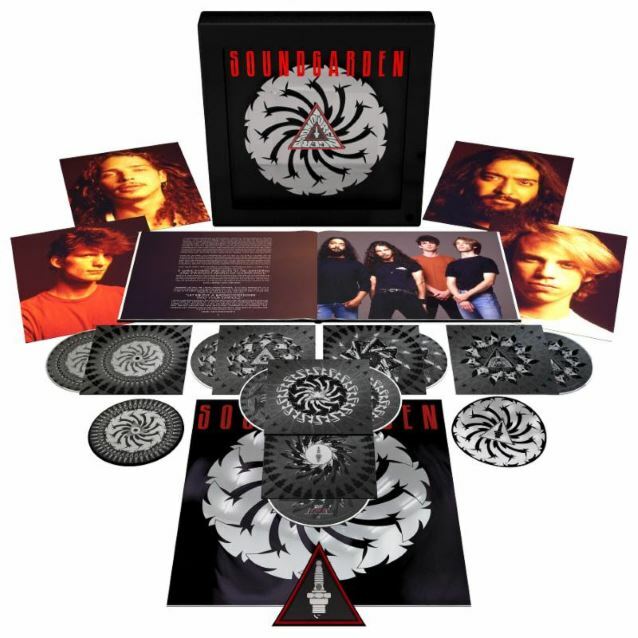 The Super Deluxe version also includes a revolving "Badmotorfinger" icon ultimate collector's box (batteries included) that features a 52-page book with a 25th anniversary silver foil "Badmotorfinger" icon cover, newly designed art, unreleased photos, and commemorative testimonials from fellow musicians and peers. The package also contains a 12"x12" 3D "Badmotorfinger" silver foil icon lenticular, four 8"x10" photo cards featuring each band member, a 5" "Badmotorfinger" silver foil icon sticker, a 4" triangular spark plug silver foil sticker, and a 5" newly designed 25th-anniversary "Badmotorfinger" icon iron-on patch. The first 1,000 fans who pre-order the Super Deluxe Edition at Soundgardenworld.com, us.udiscovermusic.com, or udiscovermusic.com will receive a bonus, first-ever commercially released 7-inch of the album's first single "Jesus Christ Pose" (b/w "Stray Cat Blues") and a custom "Badmotorfinger" icon 7-inch large hole adapter. The anniversary celebration continues with a 28-track 2-CD Deluxe Edition, featuring the remastered original album on Disc 1; eight studio outtakes, "New Damage" (with Brian May), and seven tracks from "Live At The Paramount" on Disc 2. Also available is a 1-CD remastered edition with enhanced art converting the original plastic jewel case into a gatefold softpak with the original six-panel folder design included. Rounding out the special editions is a 2-LP, 180-gram audiophile black vinyl edition of the remastered original album expanded to a gatefold jacket with a removable, limited edition 3D lenticular silver foil litho cover when removed reveals a gold foil jacket cover, 25th-anniversary vinyl etching on side four and a download card for a digital edition of the album in 320kbps MP4 AAC files. As a special option, the 2-LP vinyl will also be available in metallic silver color vinyl for 1,000 lucky fans exclusively at Soundgardenworld.com, us.udiscovermusic.com, and udiscovermusic.com — first come, first served. 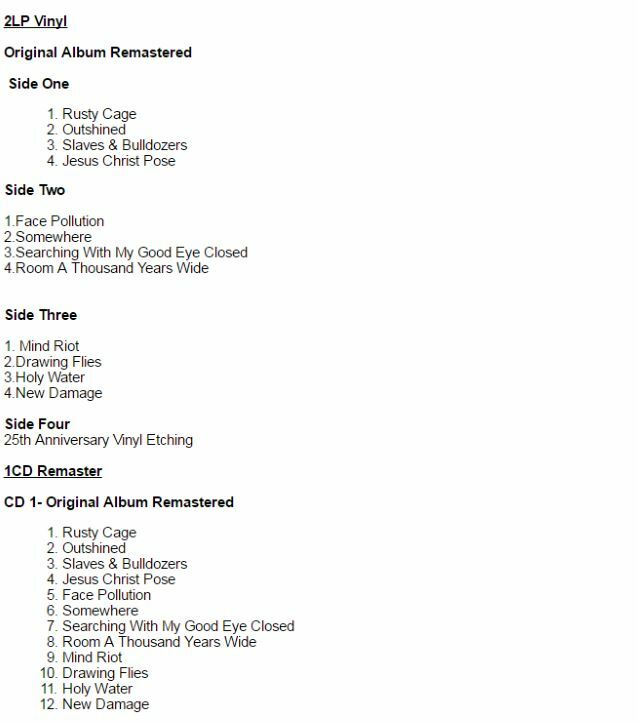 A full list of the track listing of each configuration can be found below. 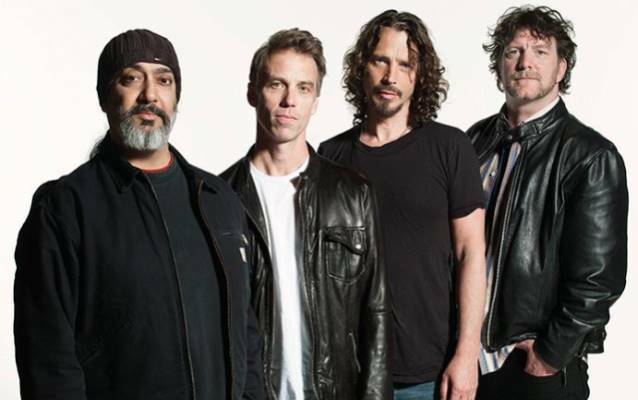 Released on October 8, 1991, "Badmotorfinger" spawned three singles, "Jesus Christ Pose", "Outshined" and "Rusty Cage", and became SOUNDGARDEN's highest-charting album on the Billboard album chart at the time. It has been certified 2x-platinum by the RIAA in the U.S.